Intense. This book begins light and easy. Sage Singer is a baker; you can almost smell (but not quite taste!) the delicious breads and pastries she bakes every night. One day an elderly man walks into the bakery and Sage and Josef strike up a conversation and then an unlikely friendship. Nice so far, eh? Josef asks Sage to help him die. Now the story picks up a bit more heat. And then we enter into the real meat of the seemingly credible novel … Josef’s tale about his experiences as a Nazi SS leader. Eventually we also get Sage’s Grandma Minka’s story as a Holocaust survivor at Auschwitz. Of course, Josef’s and Minka’s paths crossed all those many years ago. Their tales are riveting. In full Picoult style, it is hard to put this book down, even though the bulk of it is definitely intense. Yes, absolutely, it is worth reading. Footnote: In March of this year, a Nazi SS Officer, 98 years old, was revealed, living in Minnesota. 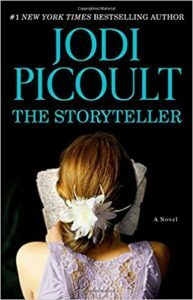 Picoult's book is not far-fetched.